We need divers, shore personnel, data collectors, and kayakers. All volunteers and families are welcome! All clean up dives are on a Sunday morning. Our program started in August of 2014. We have completed seven clean up dives, collecting over 1,100 pounds of debris and recycling materials. 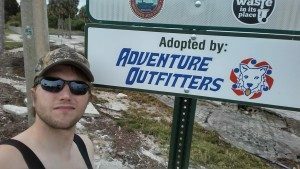 We give our data surveys to Keep Tampa Bay Beautiful and Project Aware for long term analysis and research. We rely on our loyal volunteers that brave the cold, hot weather, raging currents, rain and poor visibility. 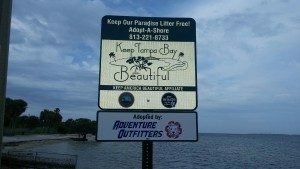 Without them, we would not be able to continually improve our community of unsightly debris, and create a safe haven for the local aquatic flora and fauna. 663 marine species; 100% of sea turtles; 20% of all seabirds; Nearly 50% of all marine mammal species; Human health and our economy; Damages and destroys corals, sponges and anemones; Damages recreational and commercial vessels; Local fisherman; and Affects the beauty of our beaches and shores. Both divers and non-divers can help end this problem by picking up debris before it floats out and deposits on the ocean floor where it can’t be retrieved. When you participate in clean up dives, you are diving for change. You make the ocean safer for marine life; the data you collect helps inform policy to improve waste management by helping convince individuals, governments and businesses to act on marine debris. Your voice and actions can change public opinion, behavior and public policies so less trash is dumped in the environment and handled properly. Our long-term data surveys give the best results. They build a more convincing argument for change and help identify local seasonal trends, such as those caused by weather patterns, tourist seasons, industries and/or events. 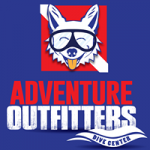 If you haven’t been to a clean up dive and are interested, please stop by the shop for more information. We would love to have you join us!